Spending our lives surrounded by Ikea furniture, bus stops and potholes can make the fantastical worlds invented by sci-fi and fantasy writers seem like a crazy, far off place. However, the real world is a weird place (which is easy to forget when surrounded by the aforementioned potholes and bus stops) and there are some parts of it that are so wacky that they look like they’re been lifted straight from the pages of your favourite book. Whether it’s a dystopian wasteland, a glittering futurescape or an enchanted forest, the real world will occasionally pull an absolute blinder and spit out a scene straight from the movies. You could venture out into the world and see the marvellous sights … but then you’d have to go outside and, like, talk to people, which is icky. It’s much easier, cheaper and more comfortable to read about them in your room. This is a nature park in Singapore, but you could be excused for mistaking it for some kind of futuristic Pandora-type world. The Gardens by the Bay were built as part of the effort to turn the already leafy Singapore from a “garden city” to a “city in a garden”. This kind of forward-thinking has resulted in a breathtaking futurescape of tree-plant hybrids that would look at home in a Disney movie. The different zones even have suitably sci-fi names like the Cloud Forest – featuring the worlds tallest indoor waterfall, cascading fron the side of an artificial mountain – and the Supertree Grove – featuring skyscraper trees covered in lush vegetation and containing a restaurant. Were this sci-fi, the Gardens by the Bay would be one of the luxury districts, perhaps full of middle-class hippy dippy types, blissfully unaware of the underclasses slumming it in districts with names like the Pits by the Esturary and the Shacks by the Morotway. For a hundred years, the people of Rjukan lived in the shadows. The deep valley in which the town was built completely blocks out the sun for more that half of the year, leaving the locals in a perpetual state of twilight. For a long time, the only way the residents could catch a glimpse of sunlight during the autumn and winter months, was to take a cable car up to the top of the mountains. In 2013, an artist by the name of Martin Anderson arrived in town and set about bringing the sun to the valley. He did this by building colossal mirror, or heliostats, on the top of a neighbouring mountain that would reflect the sun’s rays down onto the faces of the shadow people below. Now, if that doesn’t sound like some kind of dystopian-future-underclass plot device then I don’t know what does. Imagine a tyrannical government seizing control of the heliostat and using it to blackmail the people into bending to its will. There is an uprising, the people form a militia called the People of the Light and cast the baddies into the shadows. It’s beautiful, poetic, tremblingly powerful. Someone make this into a movie, I’ll settle for 60% of the profits. There is an island in the middle of a river in Liberia that the locals will never set foot on. It is known as Monkey Island, and it is overrun by chimpanzees. These aren’t just any chimpanzees, however, as they were all infected with contagious diseases as part of a research project in the 70s, in order to find treatments for diseases such as hepatitis. So why are they on the island? Why, because chimpanzees can’t swim. Surrounding them with water is a much better way of containing them than putting them in a cage. This real-life Planet of the Apes was created when the facility closed in 2005. The primate residents are looked after by local carers who bring them food and medicine, but are extremely aggressive to strangers. It is hoped that the majority of them are no longer sick, but we can’t be sure. Let’s just hope they don’t learn how to swim. Come on, this one even has the quintessential sci-fi name. Habitat 67 is located in Montreal, Canada and was built as an architectural experiment in the 1967 World’s Fair’s Expo 67. It is made up of a mish mash of prefabricated concrete boxes, stacked seemingly haphazardly on top of one another, producing the impression of a weird mix of ultra-modern townhouses with a favela. The idea was to create a community with all the benefits of high-rise living, with a villagey feel. Despite the fact that it looks a bit like an abandoned soviet project, people do live in Habitat 67, in one- to five-cube units. Despite this rather clinical description, and the brutalist exterior, they are invariably gorgeous on the inside. They’re also surprisingly cheap, with some units going for as little as £160,766. For a bit of context, that kind of money will get you this in London and this in Habitat 67. Time to learn French and move to Montreal, chaps. The snappily named Basílica i Temple Expiatori de la Sagrada Família is an unfinished church designed by the Catalan architect Antoni Gaudi. The architects will tell you that it combines Gothic and curvilinear Art Nouveau forms, but to the rest of us, it looks like one of those weirdly organic hive dwellings you get in loads of sci-fi. As if this wasn’t actually woven by some kind of hyper-evolved race of termites, who create their nests by moulding a mixture of sand and saliva with their mandibles. 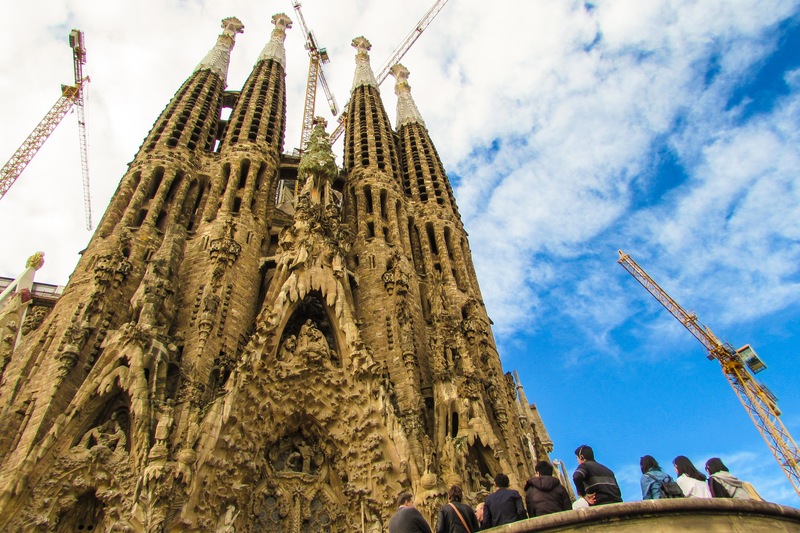 Actually, the Sagrada Família is technicallystill being woven by some kind of hyper-evolved race of termites as it isn’t actually finished yet, and isn’t predicted to be done until at least 2026. This is what it will eventually look like. Alien world? Government experiment? Photoshop? Nope, just good, old fashioned pollution. As inhospitable as it is, the river has caught the eye of the likes of NASA, as they reckon the conditions at Rio Tinto could be similar to hypothetical subterranean river on Mars and they have used this to try and figure out what life on Mars might look like. Horrible, miserable and smelly is probably the answer, given that most of it would be anaerobic bacteria. The Crooked Forest looks like something straight out of His Dark Materials (or at least how it looks in my head), and has the fairytale name to match. Located in Poland, the forest is full of weirdly shaped trees that snake out from the ground before straightening up and growing upright again. The exact cause of these wobbly beginnings remains a mystery as no one knows for sure what causes it. It is generally believed to be the work of humans, perhaps to produce curved wood that is ideal for boat building. It’s a good theory, but no one can figure out how it’s done, so there’s no reason to rule out an ancient race of wood nymphs just yet. The Six Flags theme park in New Orleans was abandoned back in 2005 after getting an unexpected hose-down from Hurricane Katrina. It has since been left to rot and decay, transforming it into something straight out of Borderlands and making it the perfect setting for some kind of grim, post-apocalyptic future. The mix of gaudy thoroughfares littered with detritus and decay and downright creepy grafitti is enough to give the average urban explorer wet dreams for a month. It’s also a great place to get murdered by a marauding gang of Mad Max wannabes (probably). The devastation was so disastrously expensive for the park owners that they basically washed their hands of it and the park has remained untouched and undeveloped since Katrina hit. The future of the site is still uncertain but, in true American style, it looks like they’re probably going to turn it into a mall. How wonderfully dystopian.